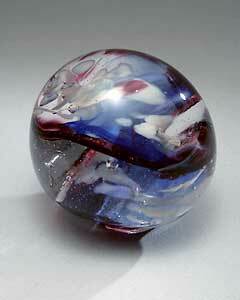 This is a fantastic paperweight. It's 2 7/16", with swirls of light blue and cranberry. The patterned colors resemble ripples and waves. BJ is the main artist on these bigger pieces. He developed a very fun technique of making a stalk for the piece to sit up on. With the stalk and the swirls of ripples, they look like Alien Brains. 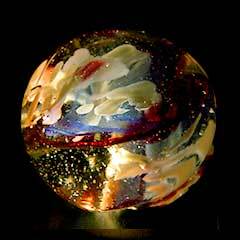 We'll be posting this one to ebay with more photos or you can visit GlassSculpture.org and get it there.